Great photo! 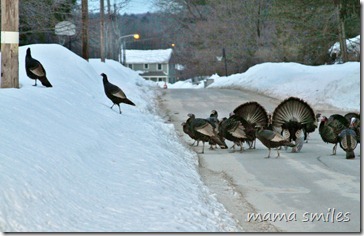 I never manage to get pictures of our wild turkeys. Oh wow!!! These are better than the free-range geese we having randomly roaming about! Do you get turkey crossing signs? It always amuses me to find signs like that for different animals. So does your neighbourhood have “caution: turkey crossing” or “wildlife crossing” signs? I love seeing the feathers fanned out – that is just so awesome! I remember a picture of turkeys you took last year too. This one is wonderful with all the snow.